Latest news and rumors from the Forge. 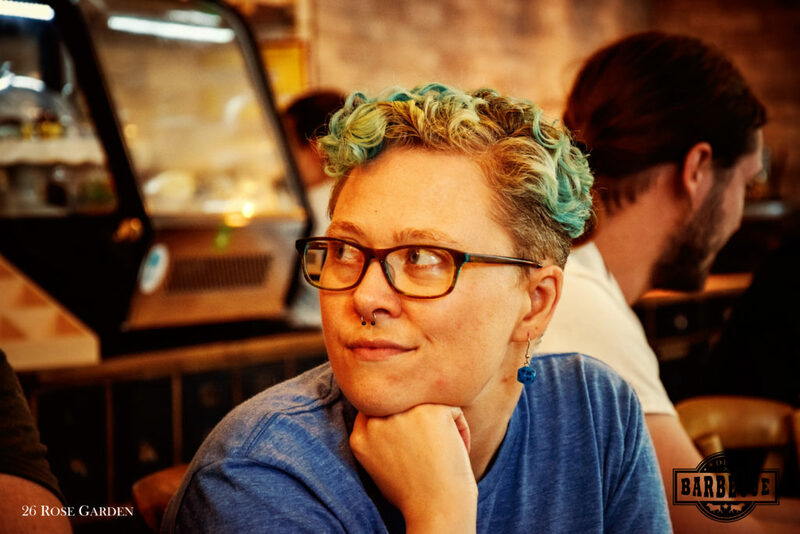 I recently wrote a blog entry about how to build worlds and tell stories in VR. 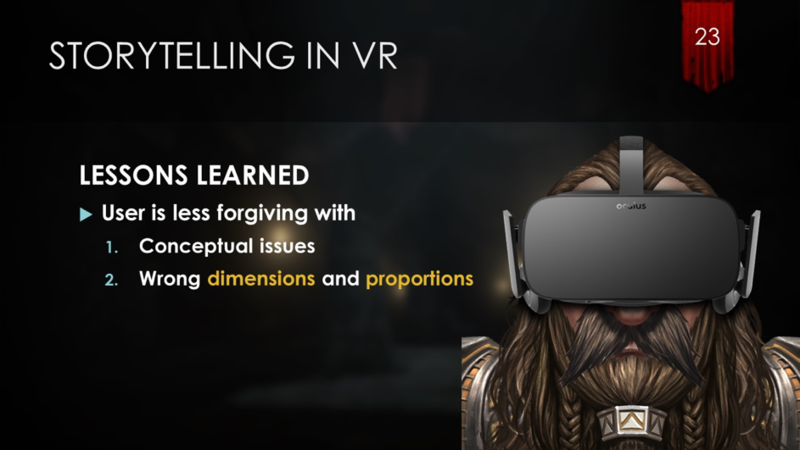 I expanded on this topic for a talk at the GameZ Festival in Zurich and, of course, I don’t want to keep the information from you, so here is Part 2 of How to build worlds and tell stories in VR. 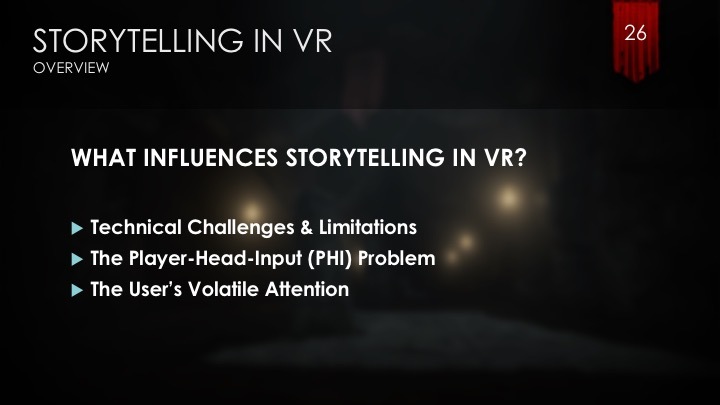 One big thing we have to think about when writing stories for VR is how the medium itself influences our possibilities. 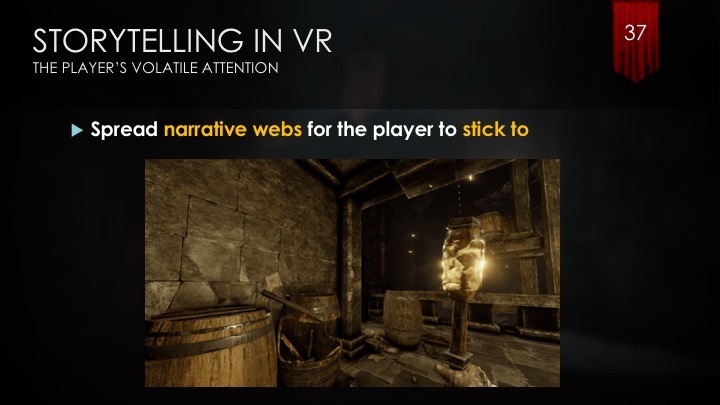 Of course, we all know that the way a story is told in VR differs from ‘regular play’, but we really tried to pinpoint important aspects in order to be aware of them and avoid pitfalls. 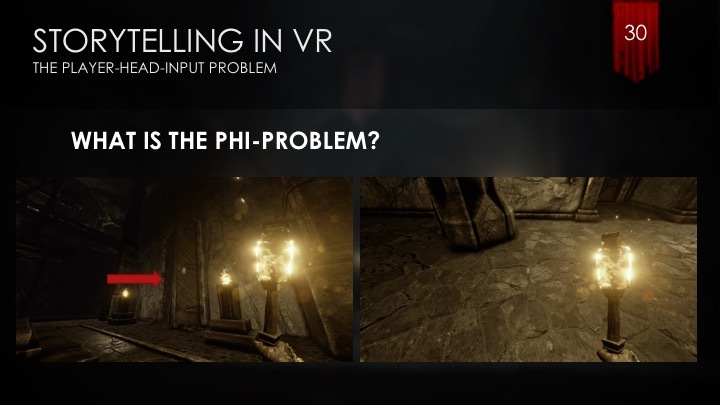 The resolution is a big topic when it comes to VR devices! Although the improvements in this area come in big steps, the resolution is still very limited, and the pixel density is very low. This means you not only have to consider the size of objects you’re placing in your world (if they are too small, they may not be recognized), but also your UI; if the font size is too small or you’re displaying large quantities of text, it may happen that the player gets tired of reading or, even worse, may not be able to read the information at all. 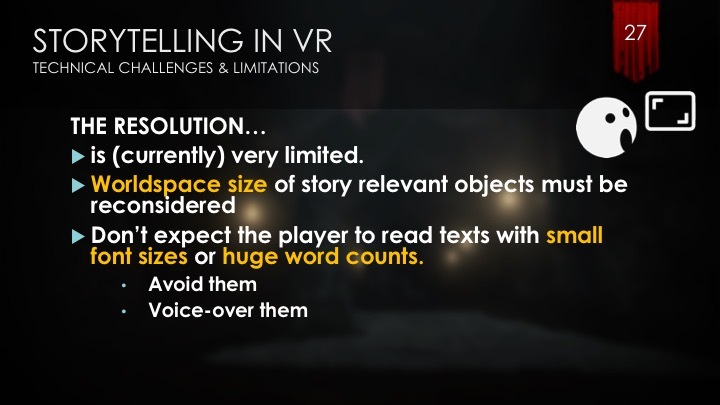 One way to deal with this is to completely avoid these types of texts, but if you need to pack a lot of information in, then use voice-overs to present it to the player. Another funny thing we have to cope with is the worldspace size of objects. 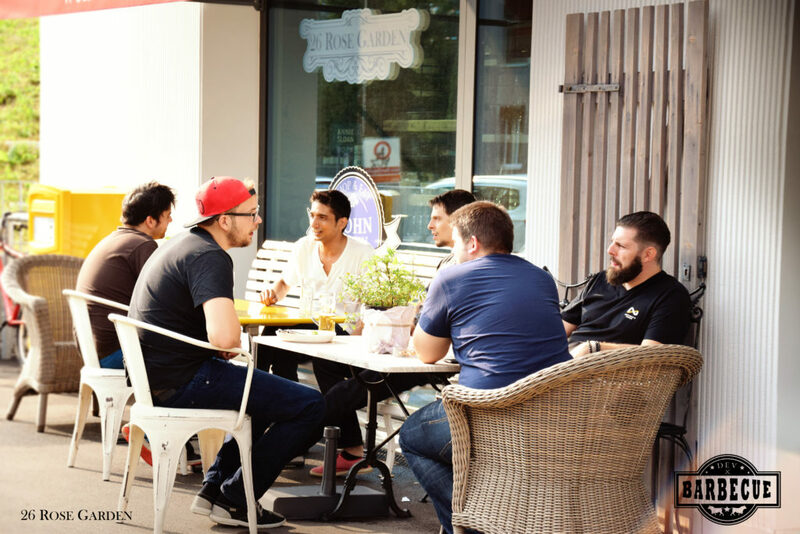 You may model your content to exact dimensions – let’s say for example, you have a table that is 80cm high and has a width of 1 x 2 meters – don’t expect that table to has actually look that size! In fact, we really had to develop kind of a sixth sense for modeling our assets so they look like the size that they should be, rather than modeling to an exact size. The most popular available devices have currently a limitation in their field of view to around 100 degrees. In comparison, both human eyes combined have a field of view of around 200 degrees. 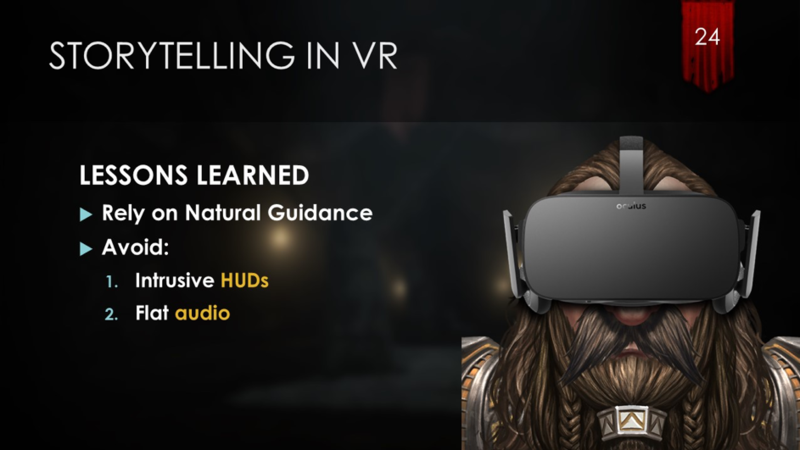 It not only very likely breaks the immersion, but also contributes to nausea. If you really have to change cameras, work with black fading. NEVER move the camera without direct user input! Cameras are the root cause of a lot of problems in VR. 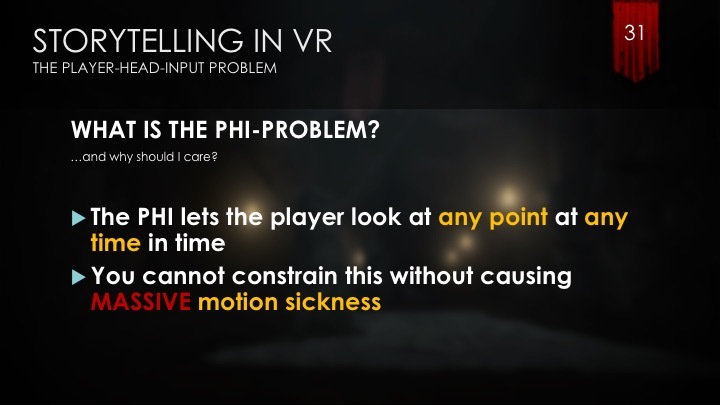 I just said that one should not move the camera without direct user input, which fixes one aspect of the motion sickness problem, but creates another one: the PHI (Player-Head-Input) problem. You want the player to look at a certain point on a door, which is indicated by the red arrow in the left image, but instead, the player does what you can see in the right image.. 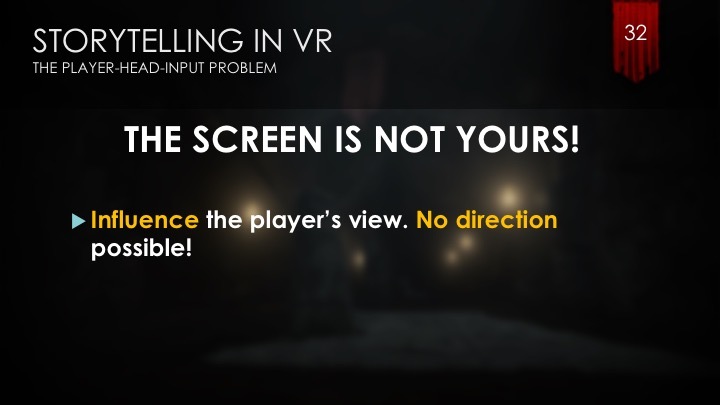 THE SCREEN IS NOT YOURS – it belongs to the player! We, as storytellers, cannot decide what the player is looking at; we can only try to influence him as he travels in our world. 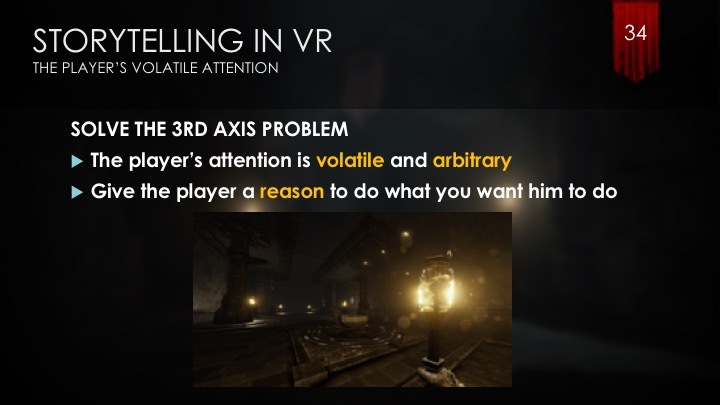 In VR, we have to create a toolset on how to do this and use it to actively encourage the player to look where we want him/her to look at. 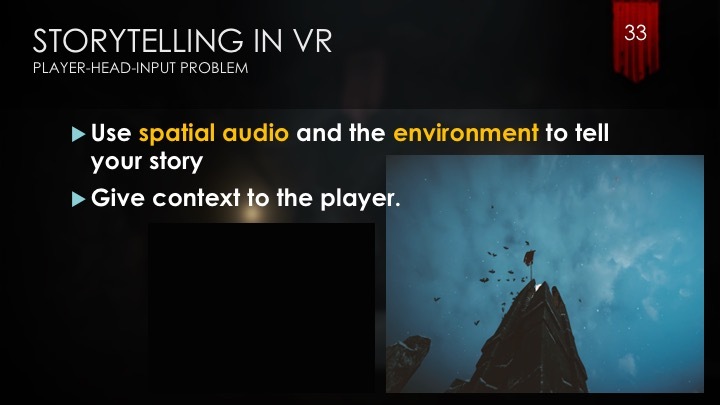 One way to guide the players attention is to use spatial audio and use the environment to tell your story. In the above scene of our game, Return to Nangrim, the player would hear croaking noises of crows when approaching the fire tower and then, when looking up, see the birds flying around it. In this way, we tell the player through context that there must be something about this fire tower worth checking out. What also plays into this problem is the user’s volatile and arbitrary attention span. 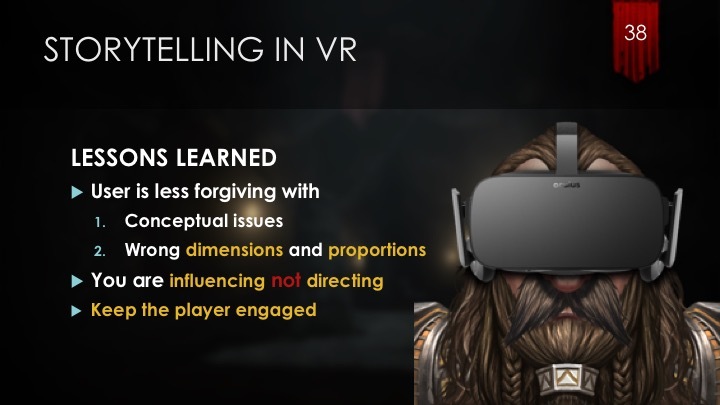 If you want to keep the player hooked on your story, you need to give him good reasons to stay interested. 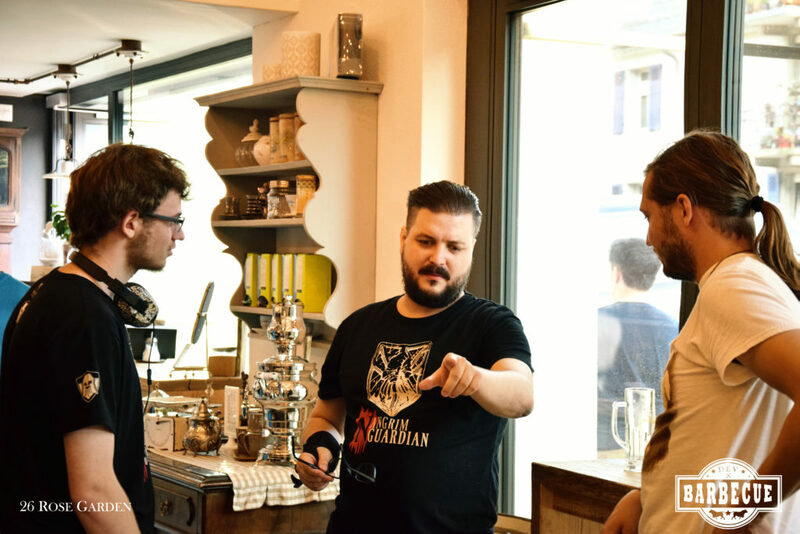 One strategy to do so is to create points of interest for the player where he can explore your world and get information. 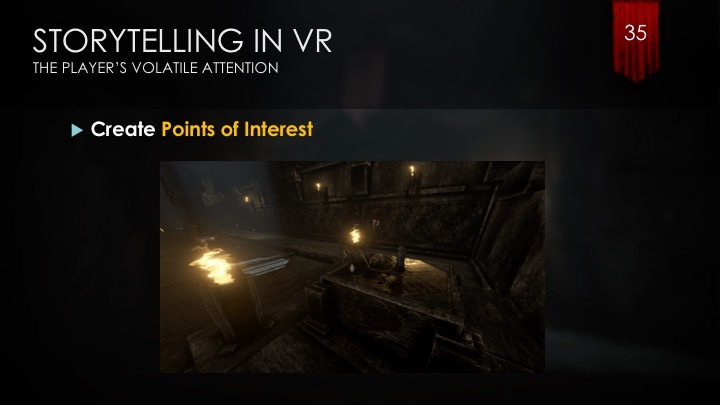 Also, encourage the player to interact with your environment by providing subtle hints like light beams or placing objects in a certain manner. And create and spread narrative webs around your gameworld for the player to stick to and stay for a while to enjoy! Remember: the screen is not yours! Influence the player’s decision by using natural guidance and keep things interesting with a lively and rich gameworld. You’re providing hints, you’re not pulling strings! 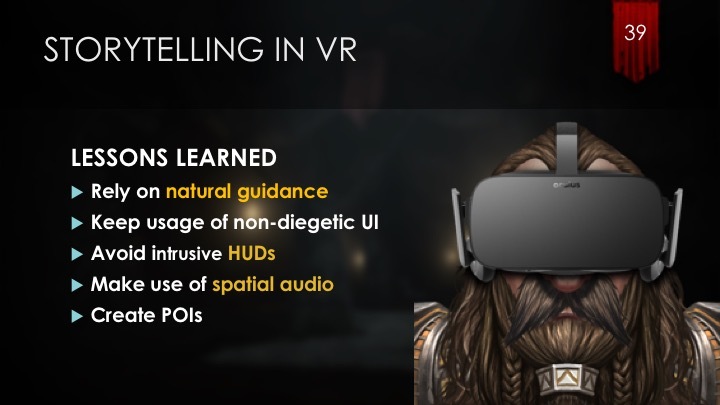 I hope this summary gave you some information that will help you with your VR story development. As always – feel free to contact me and ask any questions! 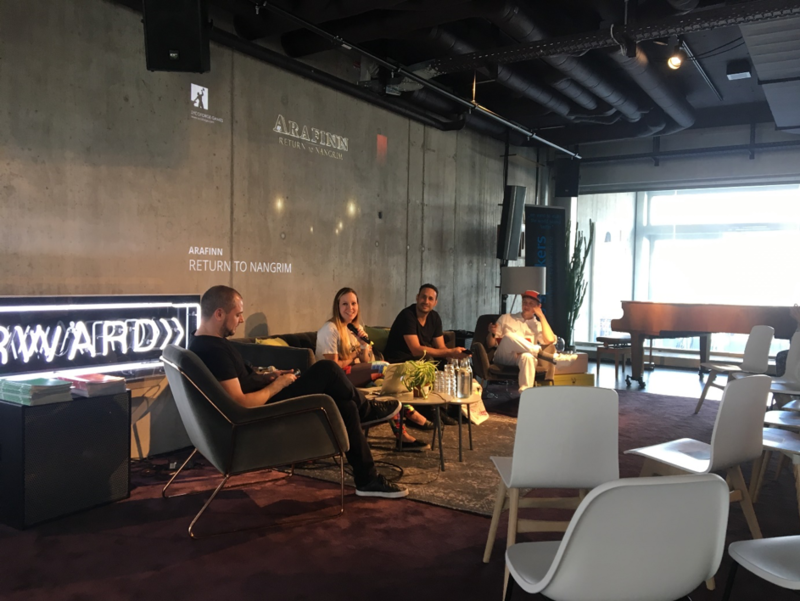 A few months ago, I was asked by the SGDA (Swiss Game Developers Association) to give a talk at the Forward Festival in Zurich, together with Stéphane Intissar, CEO of OZWE Games. 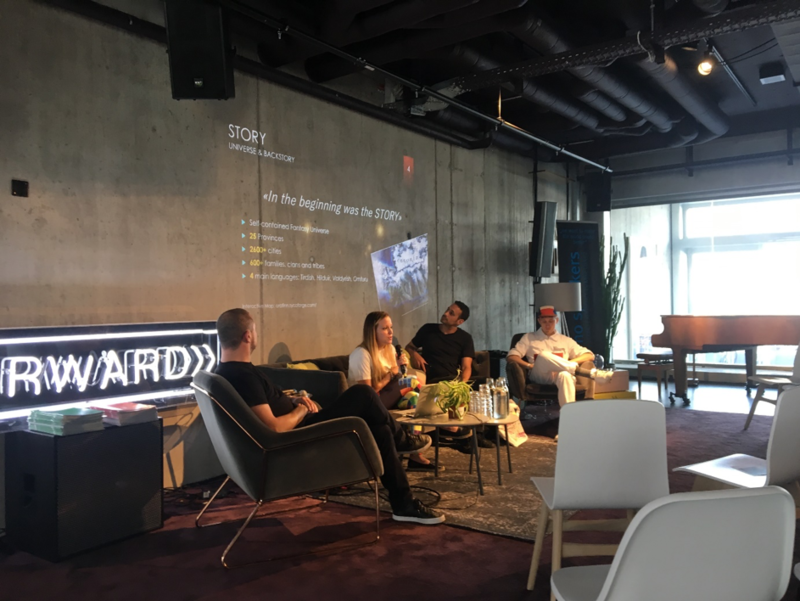 The topic: Storytelling in VR. Timeframe: 10min max, each. 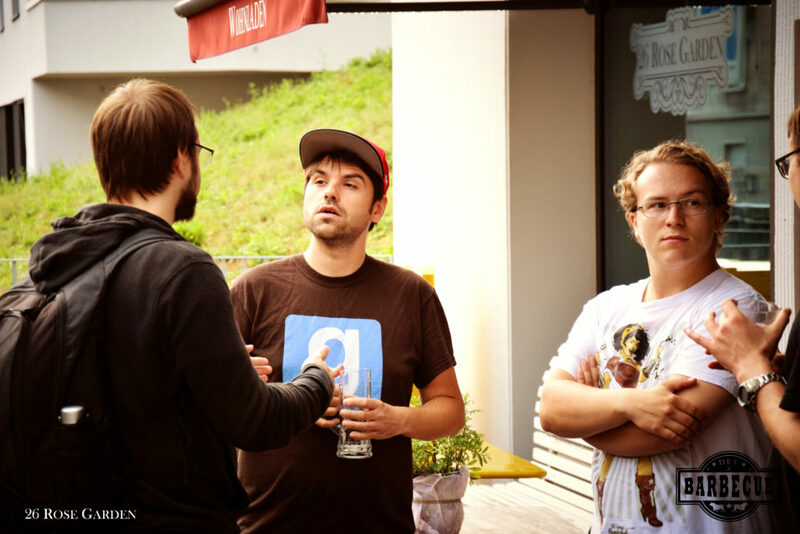 Giving that talk was a very interesting experience, so I decided to write this blog entry to share some of the things I spoke about. 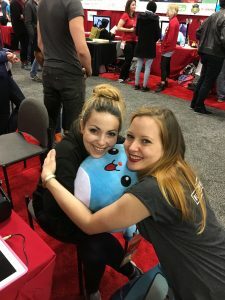 So, here’s a wrap-up of the lessons we’ve learned and the worldbuilding approach we’ve developed over the past 9 years. I hope you enjoy it! 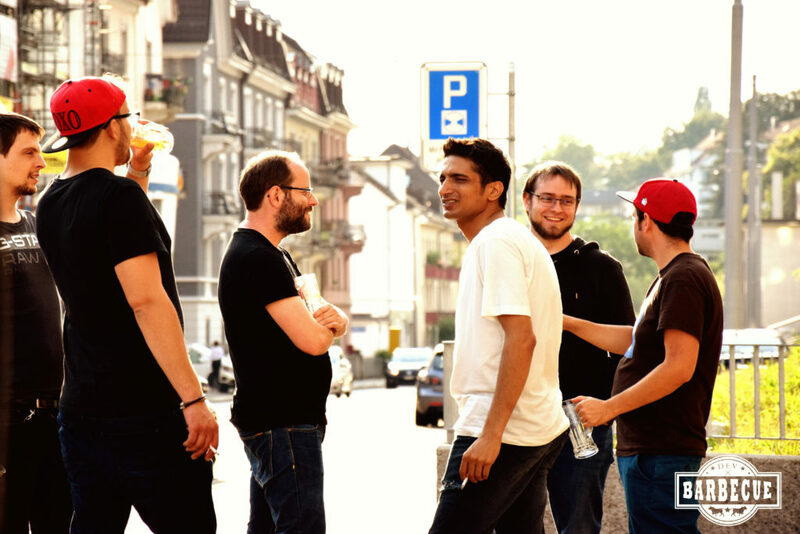 Before even thinking about making an actual game, we started with the creation of our universe. To get to those 600+ families, clans and tribes mentioned in the slide above, we had to brainstorm, sit together, argue together and discuss A LOT. 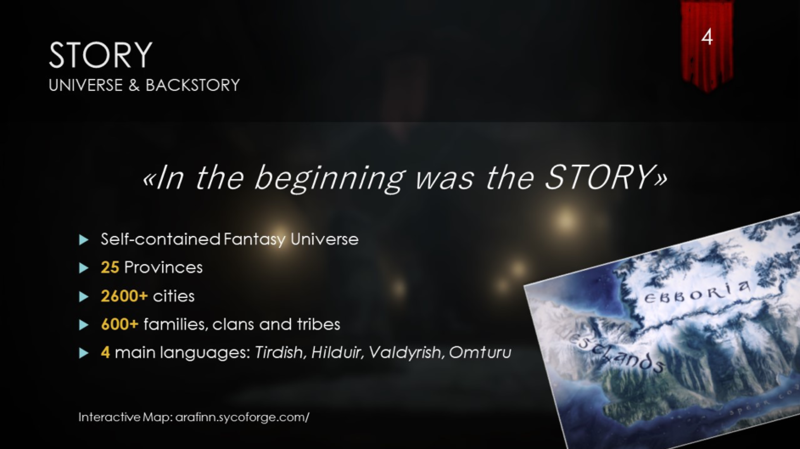 We spent almost every night during our time at university creating the Lore of Arafinn. Beginning with names and a world map, with time we created a huge compendium to describe each and every aspect of the Lands of Arafinn. We had a clear vision in mind: creating a self-contained fantasy universe. To us that means every fact, event, happening etc. must make sense and our universe must follow a logical structure based on rules that we define. 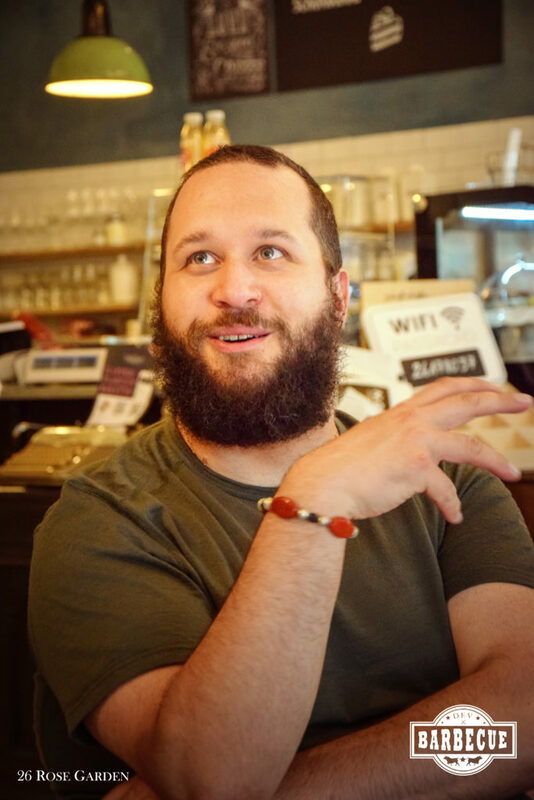 In order to achieve this goal, we knew that we could not just start developing a game or write a book from scratch but first had to let our universe grow. 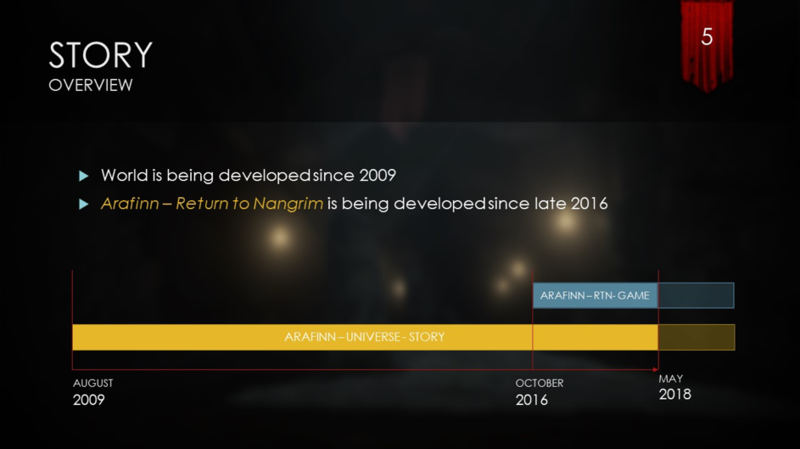 By the time we began with the development for Return to Nangrim, 7 years had already passed. 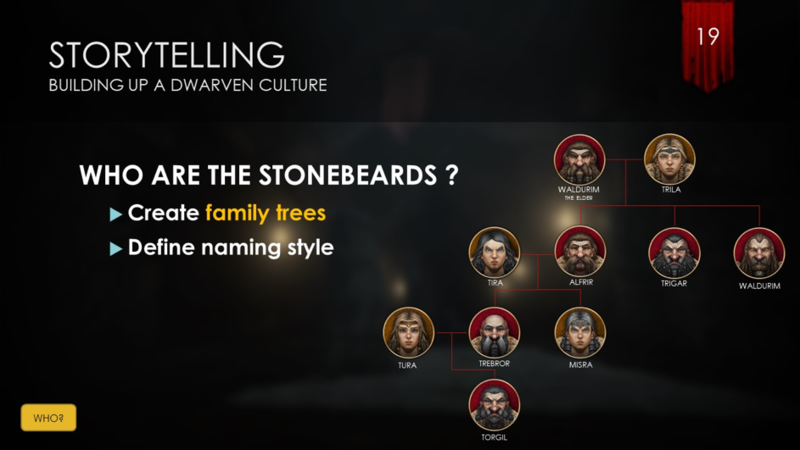 One thing that evolved throughout those 7 years was the culture of the Stonebeards, the most powerful dwarven family of Arafinn. 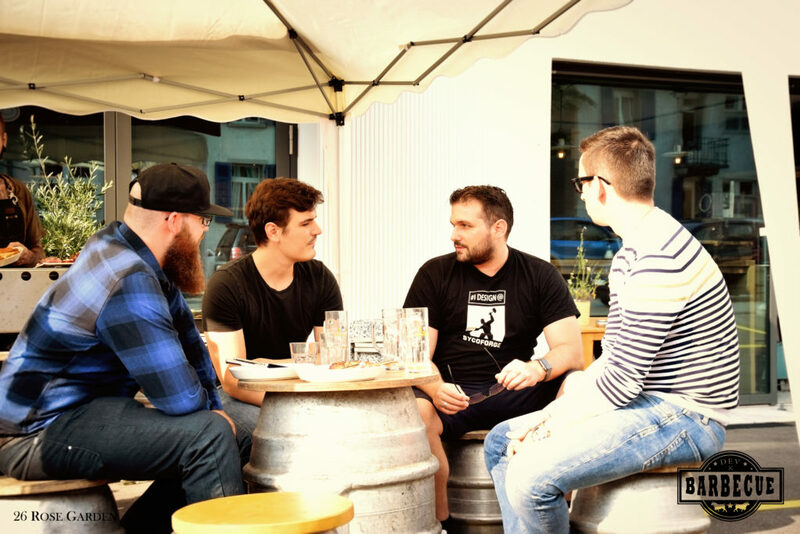 The rest of this blog entry will focus on the development of this specific culture but can be seen as a template to be adapted to fit any aspect around which you’d like to build a self-contained world. You will need TIME, and by this, I mean a lot if not most of your free time. And not to forget, probably the most important skill: endurance. Together this forms TIME, which really is the key – take your time! Rome wasn’t built in a day, and nor will your universe be. What, Who, Where, When and How? As you can see in the slide above, the questions are not necessarily consecutive, and may be fed back for multiple iterations. This makes sense, as often, for example, you may need to ask yourselves . 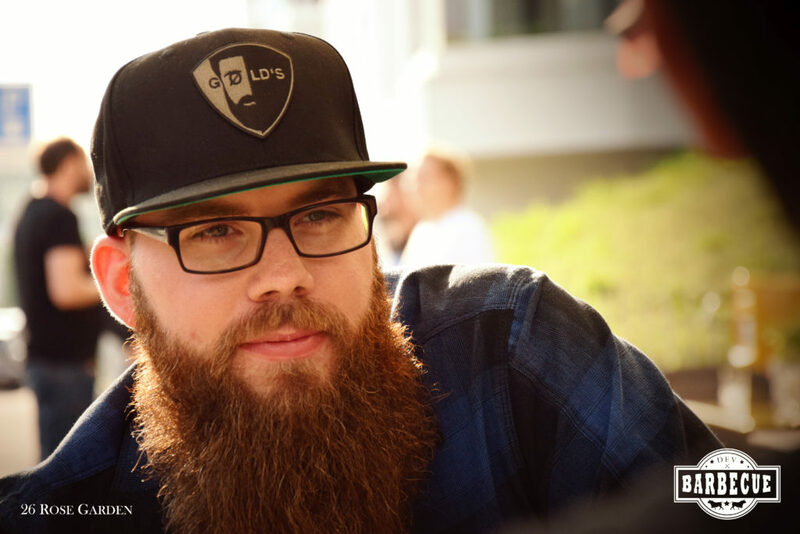 For example, asking yourself: “Where do the Stonbeards live?” automatically implies questions like: “What is the weather like where they live?” etc. (but more on that later). 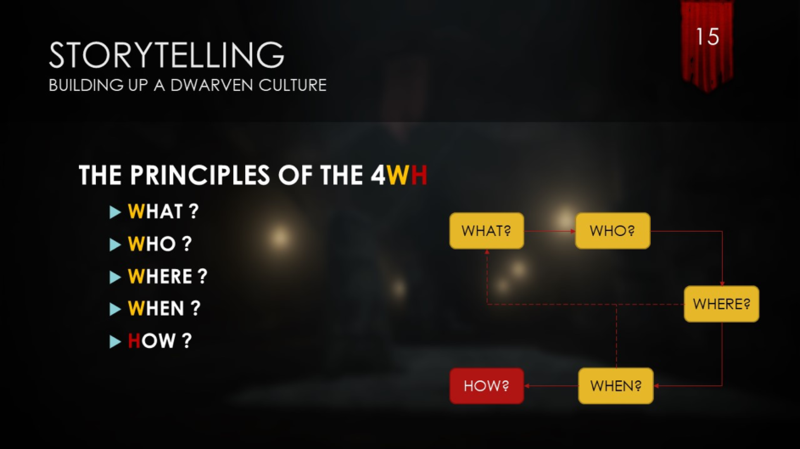 Going through those questions in detail and doing multiple iterations gives your story structure, context and depth. Now, let’s begin with the first question: WHAT? 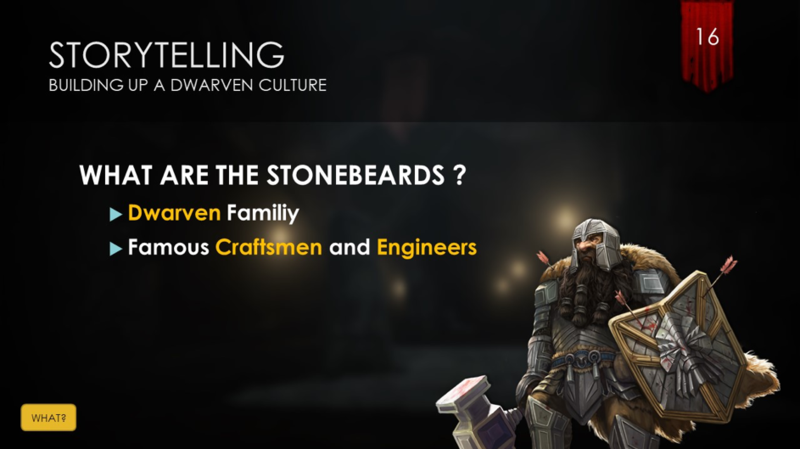 In turn, the answer should be as simple as the question: the Stonebeards are a dwarven family that are famous craftsmen and engineers. What language do the Stonebeards speak? In our case, this question is far from trivial. 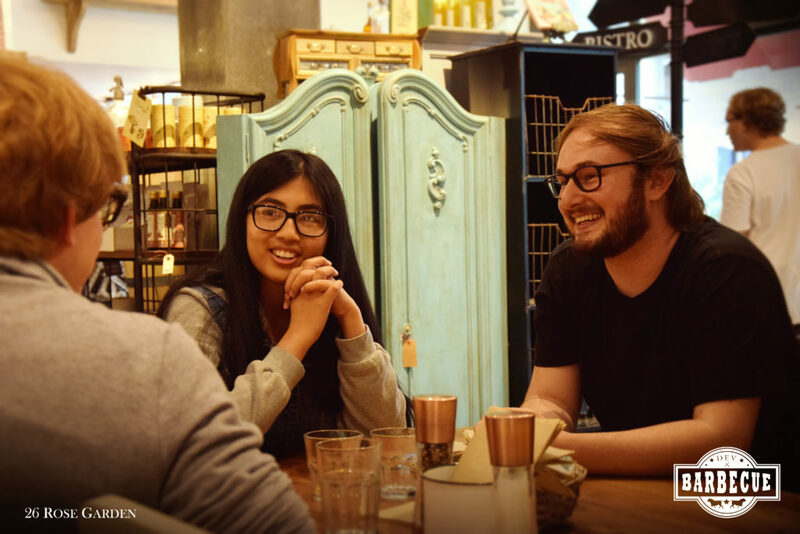 As we aim to create a fully immersive universe, we decided to develop languages that are speakable and writable. 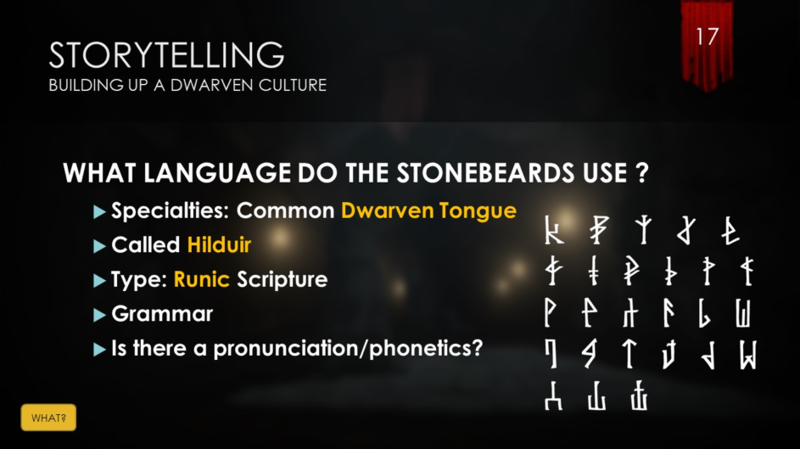 For this reason, we teamed up with a language scientist who is helping us to develop grammar and phonetics for the 4main languages spoken in Arafinn. 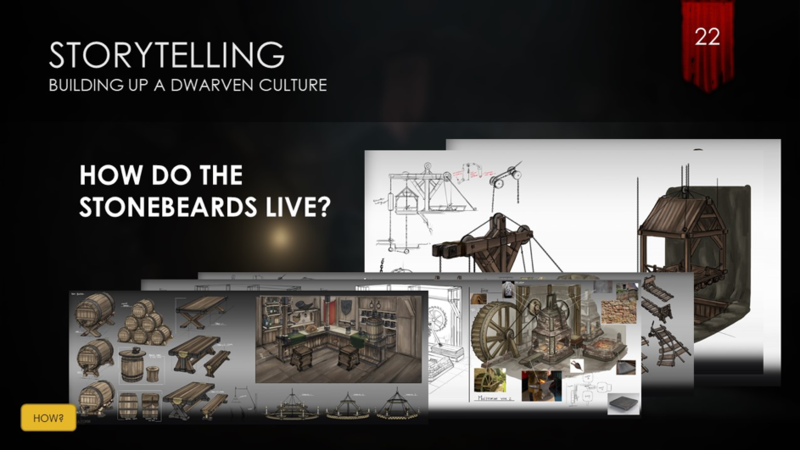 (Hilduir is a common dwarven tongue) help create context and bring your characters to life. Probably the most complex questions to answer in detail are the who questions. In the case of families, clans etc. I like to begin from a broader perspective and work my way down to individuals. 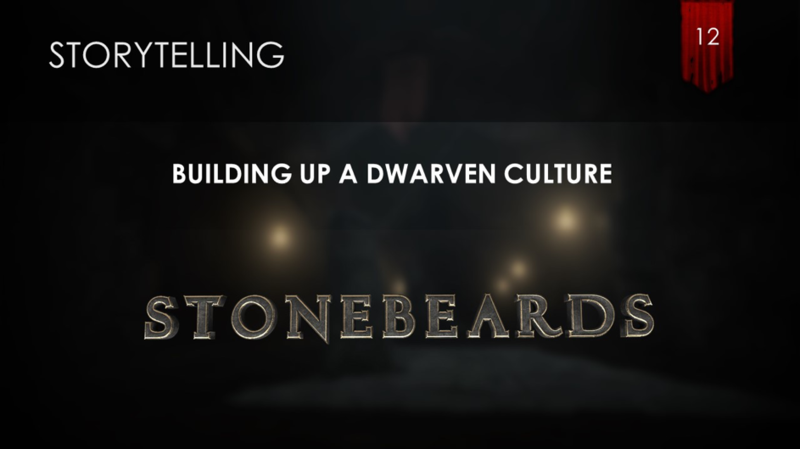 As we already know what the Stonebeards are (the Stonebeards are a dwarven family that are famous craftsmen and engineers), now it’s time to flesh them out. To do so, a helpful tool is the family tree! They help you keep track of your protagonists and create order and context. Imagine A case where you have a son who is named after his father. How are these two distinguished? In our case, we chose to add the suffix “the Elder” to the father’s name. 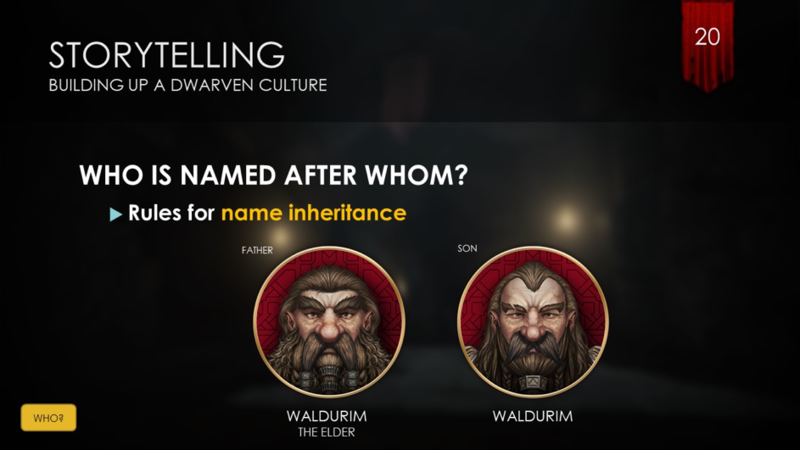 So, our father, Waldurim, is now “Waldurim the Elder” and his son is just “Waldurim”. You can also consider naming convention for royal inheritance. For example, the son of a reigning King (actually the prince) has the suffix “Stintrag” which means “Stone Carrier” in Hilduir. Describe their environment in as much detail as possible – what they eat, where they sleep etc. 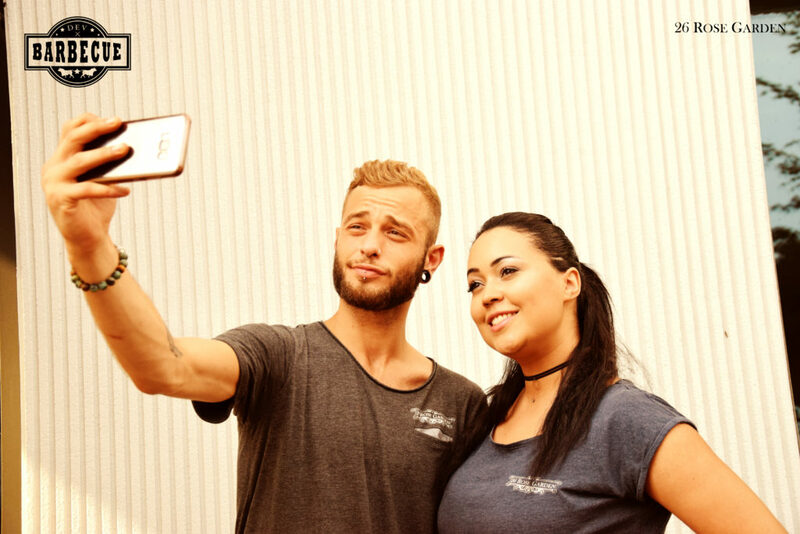 Create some concepts to get a feeling for their culture and to manifest your inner picture! If you followed these steps and did some iterations, you probably have a quite solid characterization to work with. But why is this so important? 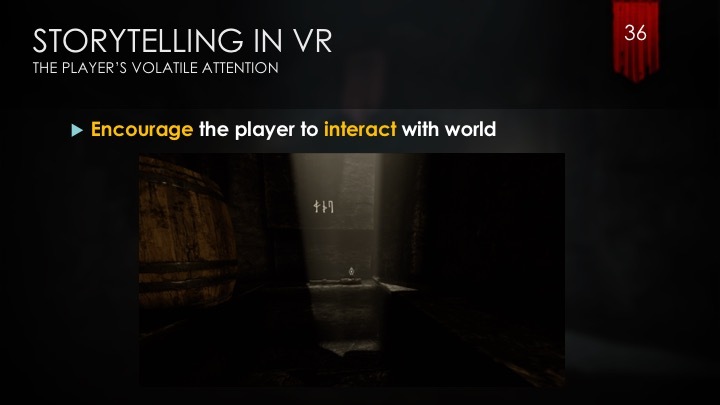 And what does this all have to do with VR? 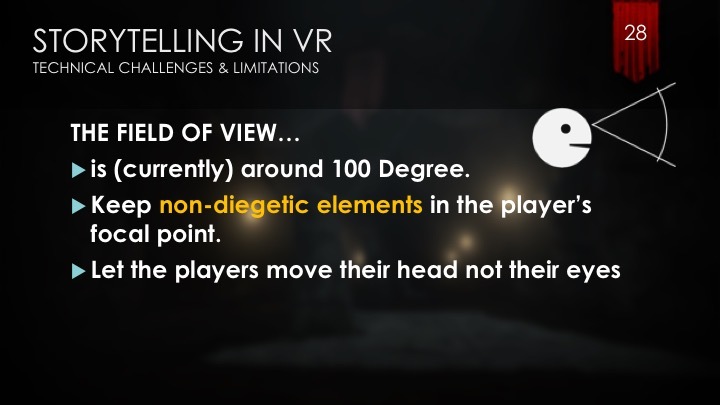 Well, as well as the user being less forgiving of wrong dimension and proportions in VR, this is also the case for conceptual issues. 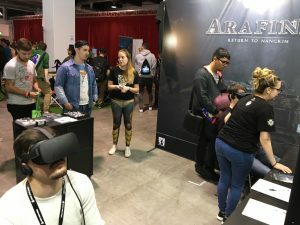 As VR is such an immersive medium, players get dragged into the world of the game, and as they can observe this world hands-on, this also means that they can observe every mistake you made in terms of logic, consistency and/or coherency from totally different angles than when playing “normally” on a flat screen. 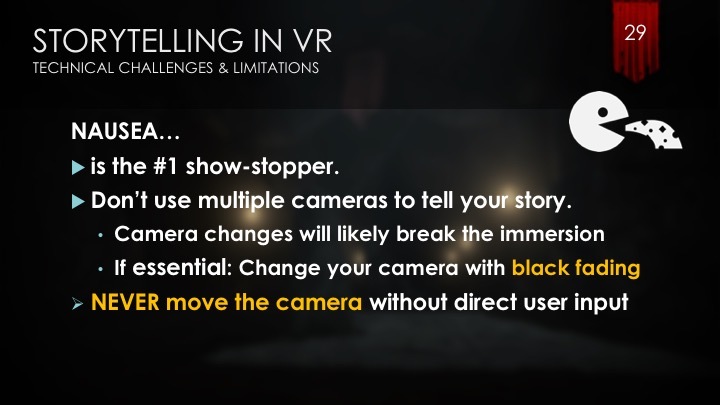 A lot of techniques that work perfectly well in regular games don’t work so well in VR. 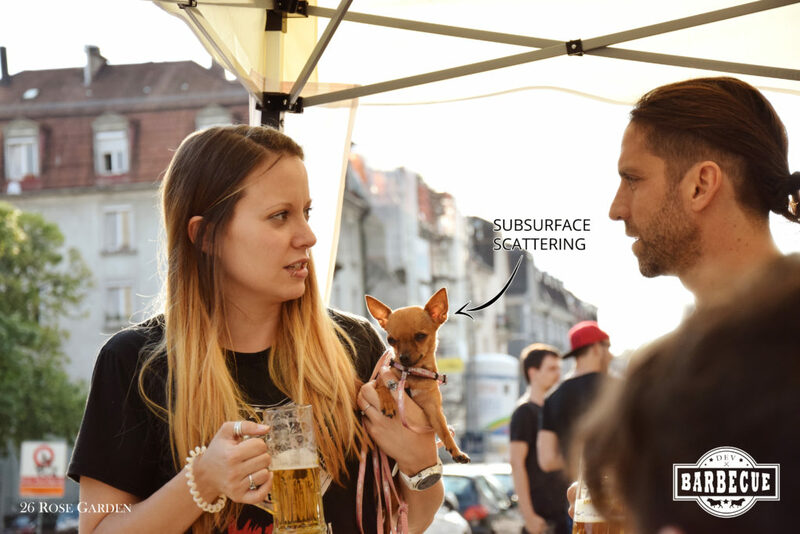 Also, please try to avoid intrusive HUDs and flat audio – these are atmosphere killers! 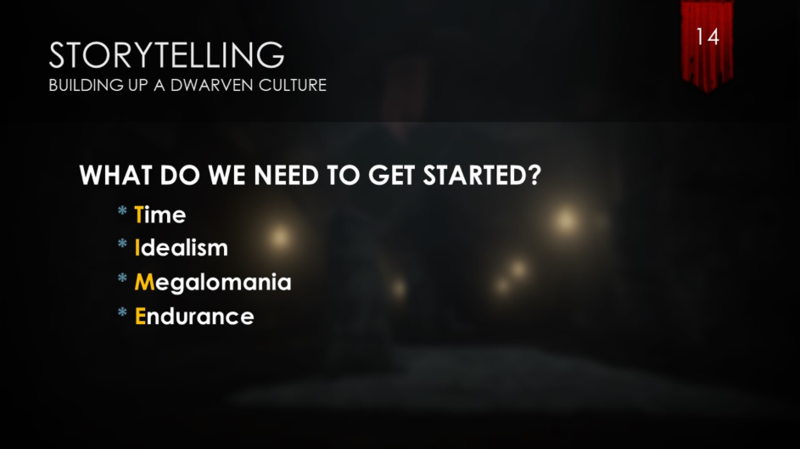 I hope this short summary gives you a handy toolkit for your worldbuilding and its application in VR. As always, if you have any questions, feel free to get in touch! 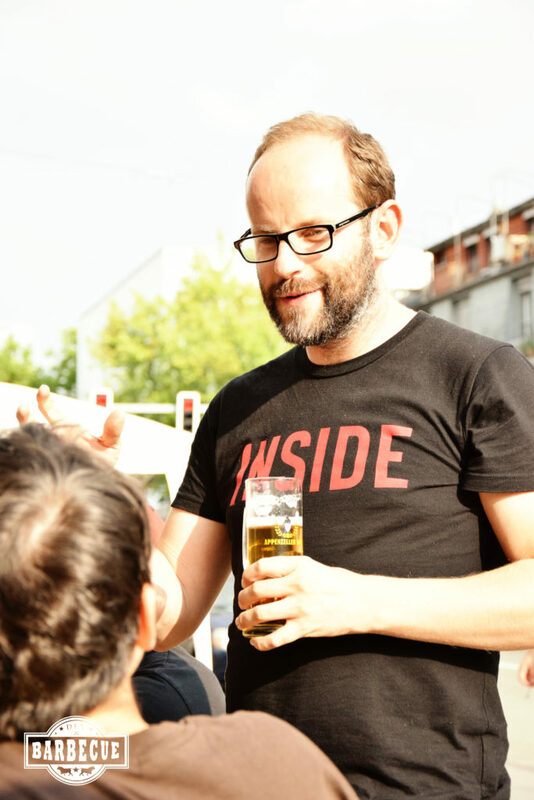 In the last week of June, we had the pleasure of hosting the very first Swiss Gamedev BBQ at 26rosegarden in Zurich! After weeks of preparation and brainstorming all invitations had been sent out and the big day was finally here.. The whole week the weather was quite nice, but on the day of the BBQ the weather gods decided to rain cats and dogs. But this wasn’t going to stop us from hosting an awesome event, so we kept on setting up and ignored the weather completely. 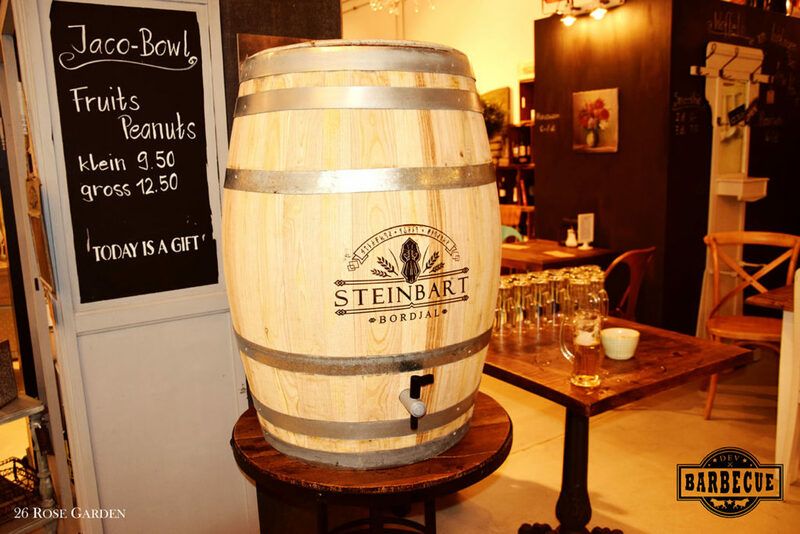 We took care of the physical wellbeing of our guests via plentiful beverages, including Bordjal (the Stonebeard’s Hilduir translation for beer) that could be tapped directly from a Stonebeard keg! 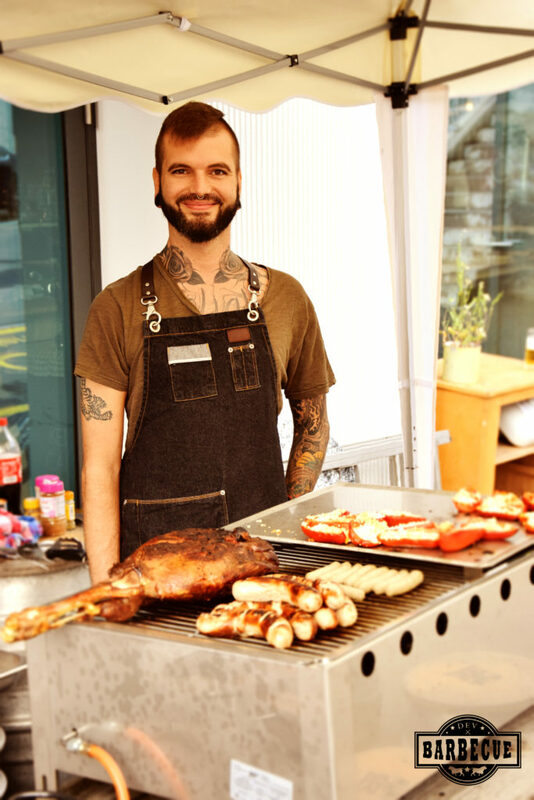 Our grillmaster Jacomo from 26rosegarden gave it everything and lit up the grill despite the weather. 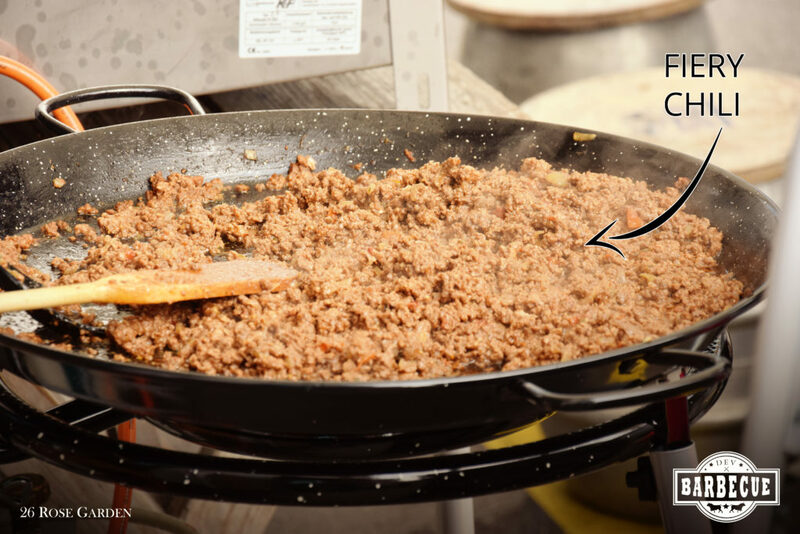 And as well as different typical swiss grill specialities, he also prepared an awesomely delicious flamin’ hot Texas Chili that was inspired by the awesome original recipe that reddit user u/FictionalHerbage provided (Thank you again! We will try the original one as soon as we get our hands on all the original ingredients 😊). And then finally the gods decided to be gracious, and the weather cleared up just in time for our first guests to arrive! 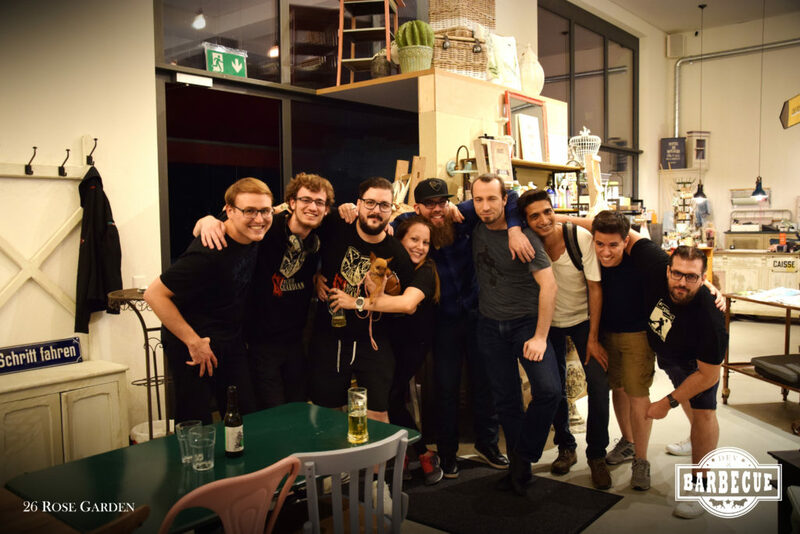 We were pleasantly surprised that so many swiss game studios gathered together to share a fun evening together. And just having a great time together! 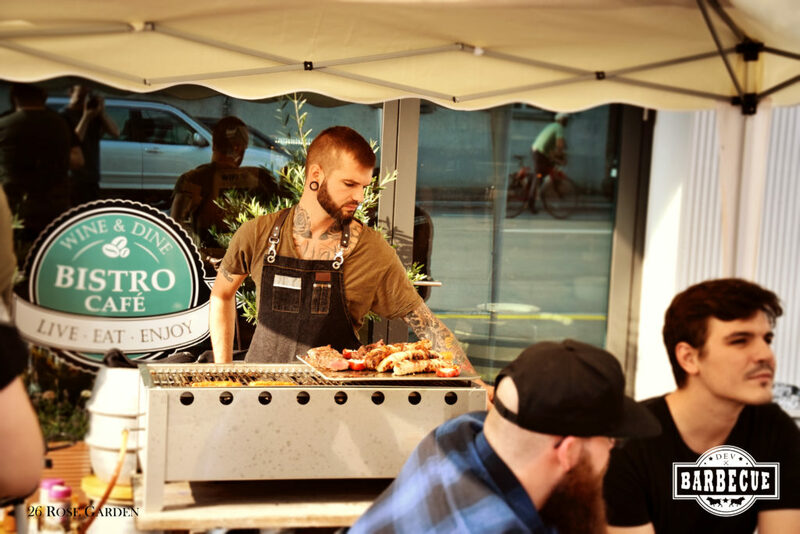 We’re looking forward to the next event! How was it to spend one’s days deep down inside the mountain, only occasionally seeing the light of day? How did the humidity of the cold stone feel on one’s skin? 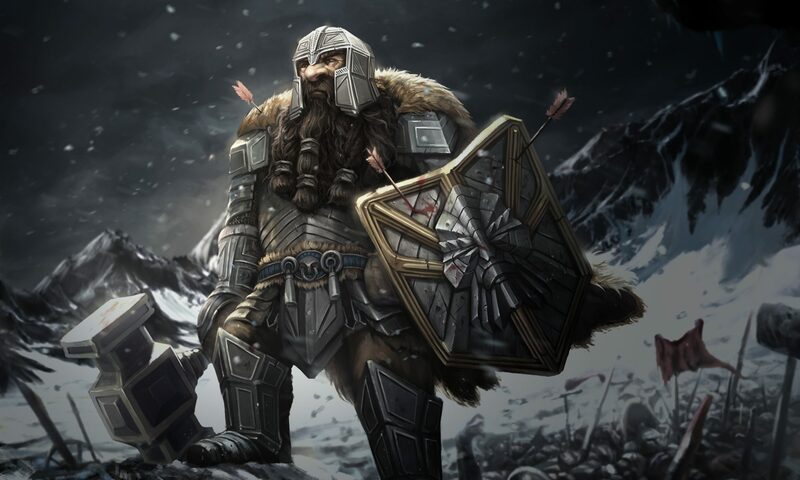 What difficulties would have arisen from the smaller stature of the Stonebeards when compared with real-life humans? What consequences – both physical and psychological – might have occurred due to open-cast mining? What did they eat? Where did they sleep? What was their social life like? As you might have guessed, this is quite a time-consuming task and requires a lot of documentation, commitment and networked thinking. First, we began with the look. 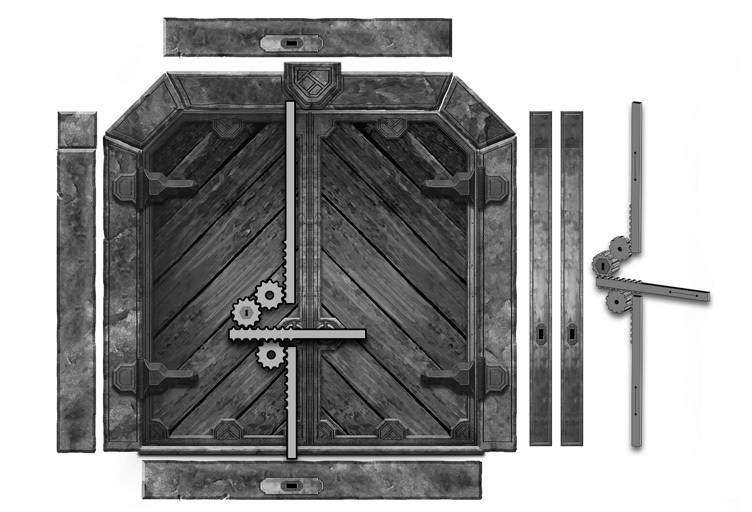 This was the easy part, as we all had plenty of ideas for how an epic dwarven door could look. 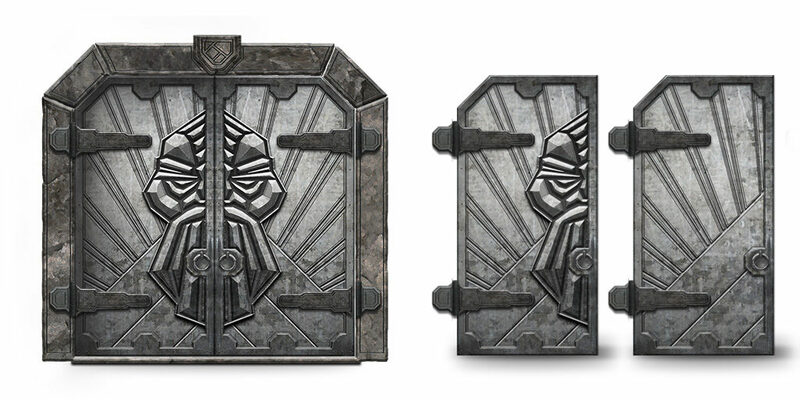 As a second step, we asked ourselves what different kinds of doors would have been used in Nangrim: Wooden doors, stone doors, massive doors, smaller doors, two winged doors – plenty of different materials, shapes and sizes – but there was one very important feature that challenged our gray cells: some doors need to be lockable. The easiest solution would have been to say: ‘ok, we’ve got a door, it has a lock and we’ve got a key that opens and closes it’. Probably in 99 percent of the cases this would have been sufficient, but then again, we’re back to our black-box-magic. And what if there’s a broken door somewhere? Shouldn’t part of the underlying mechanics be visible for the sake of realism? So we did a lot of research on locks and keys and how they were engineered in ancient times. Did you know that Homer mentioned a lock on a temple door in his Odyssey? Well now you do! 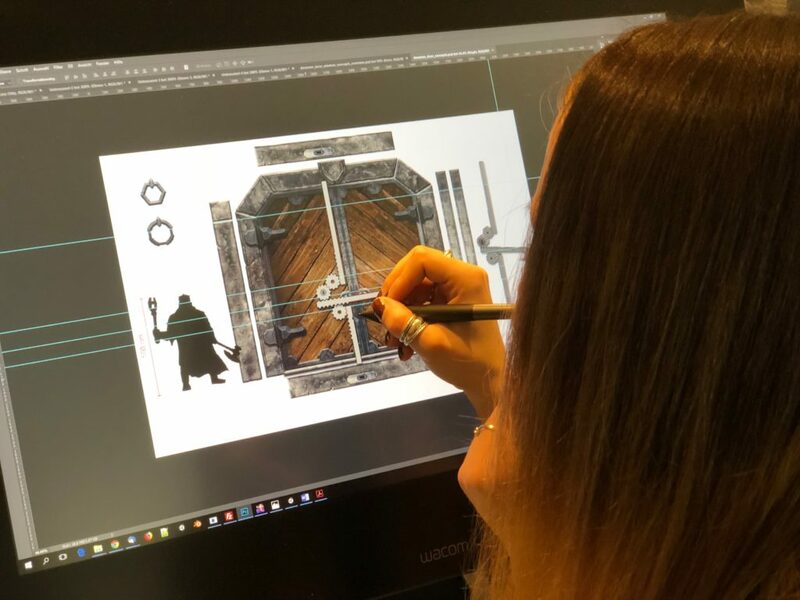 Based on this newly acquired knowledge, we worked out our own concept for the door mechanics in Nangrim. 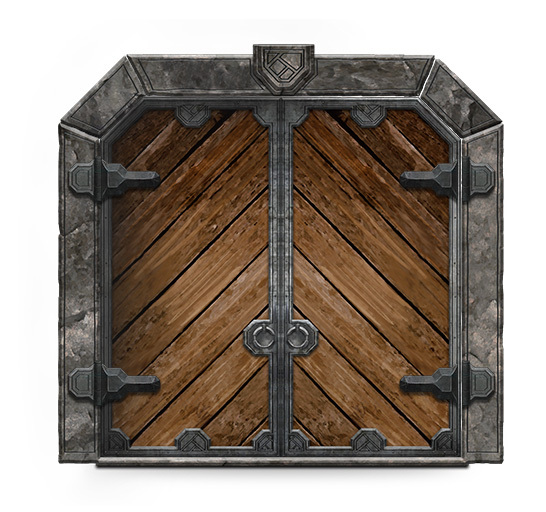 So, if you come across a closed door in Nangrim, rest assured that there’s some functioning real-world mechanics behind it! Is this really a man’s world? I love playing video games since I was a little child of three or four years. A Gameboy and ‚Super Mario Land‘ as a present, was the beginning of a relationship that should last up to this day and most certainly will forever. A few years later, while my setup had already extended to a Super Nintendo, my second calling became clear: programming. I had a learning computer which allowed the execution of own code, but unfortunately, the line ‚draw rainbow‘ only led to a ‚syntax error‘ instead of a monochrome, pixelated rainbow drawn on the screen. A Sega Saturn – (which the guy in the shop told us would be the future and is ‚way better than PlayStation‘) – and (obviously) PlayStation later, I got a Nintendo 64 for Christmas together with ‚the Legend of Zelda – Ocarina of Time‘. Boy, was this feeling amazing when I first entered the Hyrule-Field after completing the Deku Tree dungeon! This was the moment I knew that I want to create my own game one day. Another-few-platforms-up-to-PlayStation-3 later, I was studying IT and programming my own little game-engine for one of my courses. Today, I’m an IT-Engineer and CEO of my own Game Studio Sycoforge. There’s only one fact that however seems to amaze people all the time: I’m a woman. 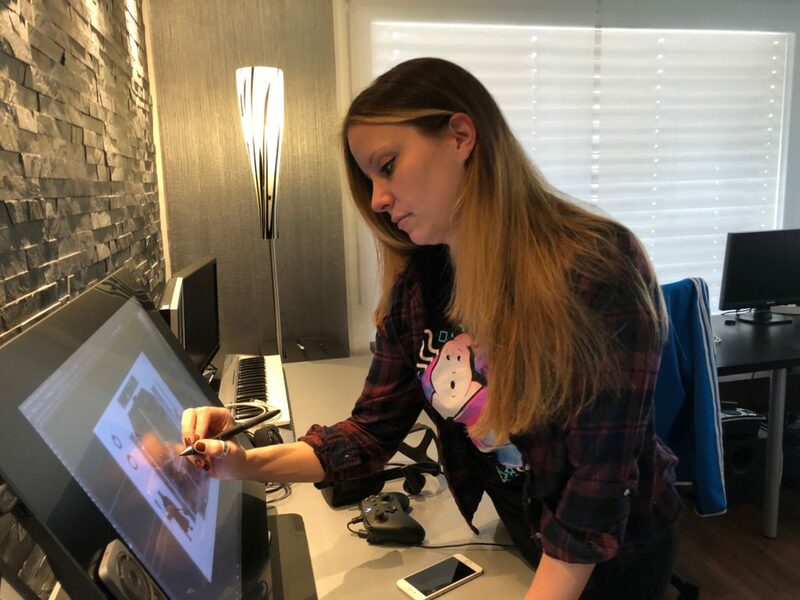 I can somehow understand, that during school in the 90’s, the other girls in class wrinkled their nose when I told them that my favorite hobby is gaming whereas the boys found it pretty cool to play a game or two over lunchtime (I’d still beat you in Soul Calibur, Andy! ), but I thought that the whole Girl- vs. Boy-thing was a relict of those days. But apparently, I have been very wrong! equal possibilities of people to talk to, but you know what? While it is true, that a lot of people don’t differentiate between man and woman, it still got very obvious that there’s also the other part: those guys and girls (yes, in this case, there’s equality!) that equate women with ‚booth-babes‘. I first encountered this phenomenon at our second convention when there were a lot of people standing at our booth. First I thought that this was a more or less amusing exception, but I have been so wrong. The more conventions that followed, the more imminent a certain reaction became: incredulity. While the male stereotype of disbelief expressed oneself in raised eyebrows and questions like „..and you are really working on this as well?“, the female counterpart mainly consisted of big eyes and astonished „oh really?! Where did you learn that?“, which gave the whole thing kind of a positive connotation, but still. 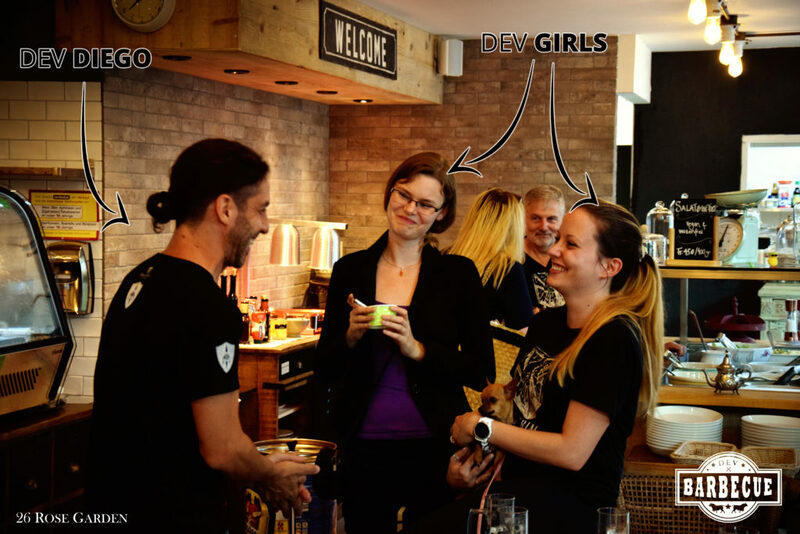 Fellow game-devs will laugh about that as we all know that there are PLENTY of women in business that do an equally good job as men. Need some examples? 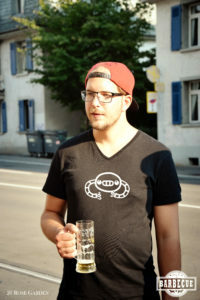 Here in Switzerland alone we have Isa Roesch who wrote her own engine in C++ for her game Cendric, Cécile Amstad, founder of Amstad Digital that brings you immersive VR worlds with Burning Bridges, and who does not know Philomena Schwab, founder of Stray Fawn Studio and creator of award-winning game Niche or Alice Ruppert who develops for AirConsole and is a welcome guest on any big talk? Just to name a few! So for this International Women’s Day, I wish my words can be one straw more on the back of the camel of awareness, so when the camel’s back breaks, hopefully, we can ask ourselves why there was a need to create such a day in the first place. Sycoforge selected as one of the 10 most desirable gaming solution providers! We are proud to announce, that Sycoforge has been selected as one of the 10 most desirable gaming solution providers by insights success. 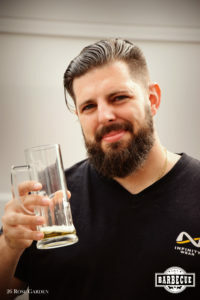 In the article, our CEO Michela talks about our vision, principles and work ethics as well as our view of the industry. Our dedication is our vision – Release of our first storybook. 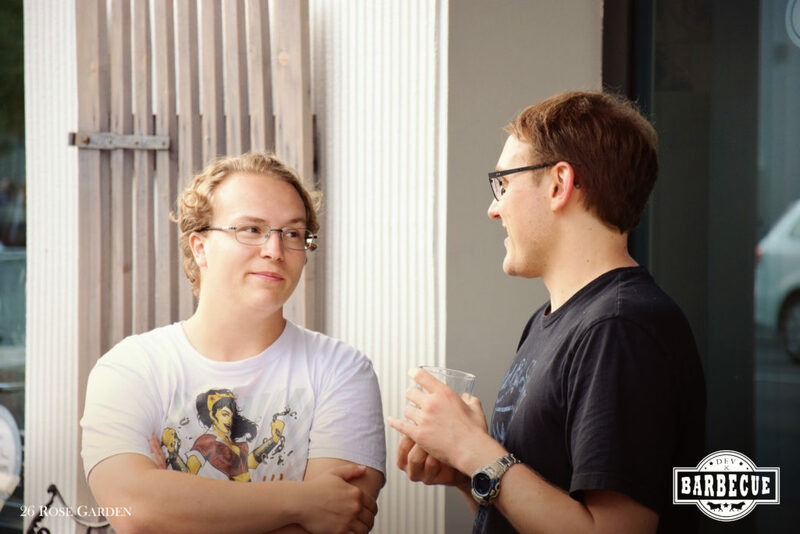 Sycoforge is a collaborative group that’s made up of a team of innovative designers, forward-thinking mathematicians, and contemporary engineers. More importantly, however, Sycoforge is about creativity. 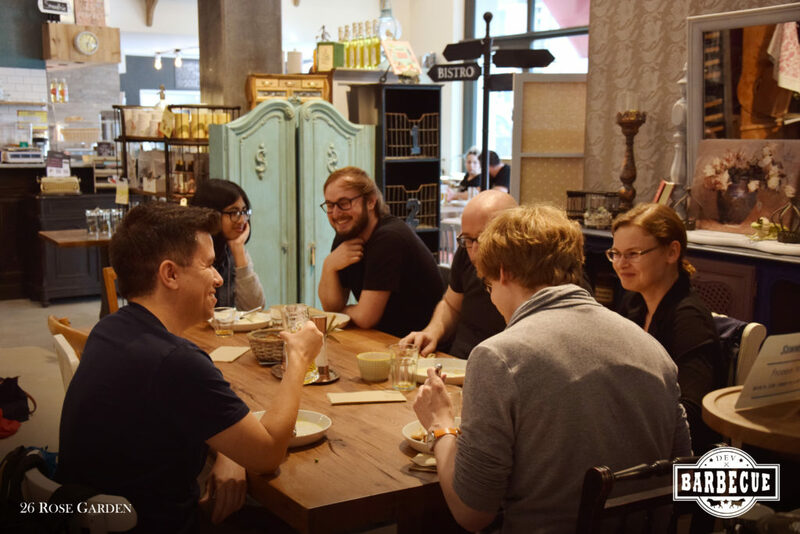 Together, we came up with something more than a state-of-the-art gaming experience, but a true, engrossing universe of places, stories, characters, and people. Our upcoming release, Return to Nangrim, is something we’ve been working on extensively with a manic attention to details in every aspect of the project. Our crew has been working to create something that is more than just a simple game, but an entirely immersive cosmos. Our dream has been to design characters that live in a world that has a broad sense of culture, history, and language. It has taken us nine years of hard work to create something that is real, authentic and so in-depth that we can open up infinite possibilities for gamers. With so much fast-paced and action-packed games on the market today, we wanted to create something different – a gaming experience that has high stakes, but that is also full of surprise, intrigue, and fascination. As a little teaser for our upcoming game, Return to Nangrim, we have launched the first chapter of an interactive audio book series about the world we have created. 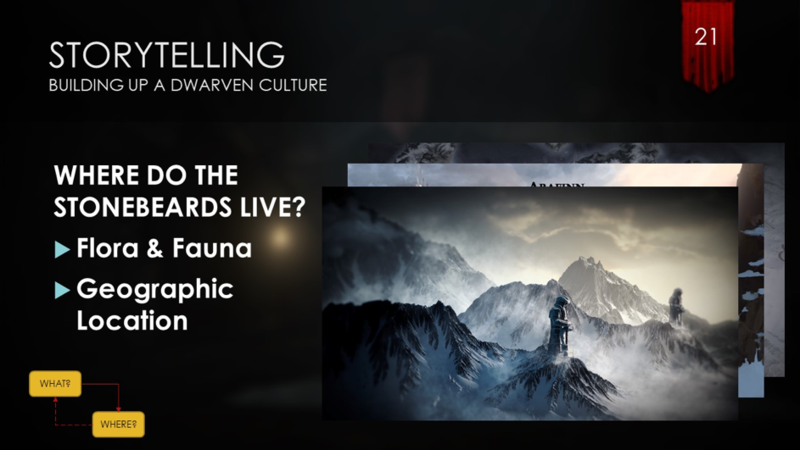 Chapter 1 will focus on the startling tale of the Guardians of the Grate Gates of Nangrim. The topic of the next installment in the series will be left entirely up to our fans: whatever character or society they want to hear more about, we will make it happen! 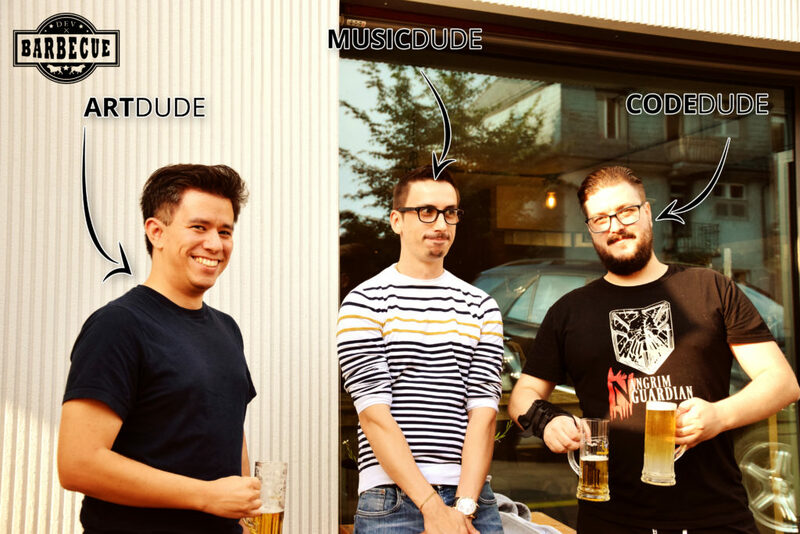 Follow the thoughts of the various devs and artists from Sycoforge Games. If you find sarcasm, you can keep it.